1. It takes 15-60 visits from pollinators for one plump strawberries. Adding pollinators to the garden can increase yield by over 500%. 2. Strawberry plants decline in quality and production after a few years so are typically replanted. 3. Strawberries are picked with part of the stem still attached. 4. Seventy per cent of a strawberry's roots are located in the top three inches of soil. 5. On average, there are 200 seeds in a strawberry. 6. 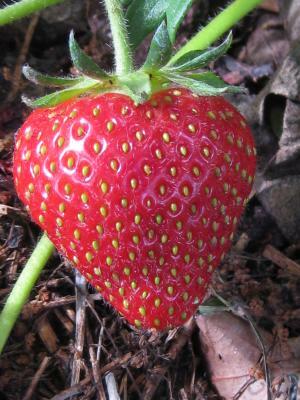 Strawberries are the first fruit to ripen in the spring. University of Illinois Horticulture educator, Kelly Allsup says, "plant strawberry plants this spring for next year's harvest of plump juicy berries." Strawberries can be greatly rewarding and only require a few simple, timed garden tasks. Before planting bare root bundles, amend the soil with organic matter. Organic matter consisting of plant and animal materials will provide nutrients and help retain water and encourage root growth. University of Illinois strongly suggests not planting strawberries where tomatoes, potatoes, eggplant and peppers have been grown because of disease issues. There are two types of strawberries; June bearing, day neutral and Everbearing. June bearing strawberries are the most commonly grown producing large plump berries for two to three weeks in late spring. One common way to plant June bearers is in a matted row configuration, meaning 24 inches between plants at time of planting. Then four weeks later, runners (daughter plants) will need to be pressed down creating a box with four corners around the mother plant. All of the remaining runners should be removed in addition to all of the flowers for the first year. Everbearing strawberries can be planted as a ground cover in the landscape. This type produces smaller berries throughout the growing season. It is imperative not to let the strawberries go through drought in late summer months or you may be compromising next year's fruits. Winter covering of three to four inches of straw will protect strawberry crowns from cold temperatures and will need to be removed in spring. Consistent weeding may be needed to keep the plants healthy. Remove all blossoms during the first growing season to ensure larger harvest in subsequent years. After the second year harvest, fertilize and renovate your strawberry patch. To renovate your patch, trim back to two to four inches and thin plants to every six inch. Strawberry crowns can be planted in containers and treated as an annual. Remove runners, fertilize every three to four weeks, and ensure at least six to eight hours of soil. Strawberries are shallow-rooted so deep pots are not needed. Encourage native pollinators by limiting chemical spray and planting blooming annuals like cosmos and zinnias to increase yield and fruit quality. An individual strawberry, which has about 200 multiple flowers should be visited multiple times by pollinators. Bumble bees, honey bees, smaller wild bees, drone flies and hover flies can be found pollinating strawberry patches. Some studies have shown that honey bees like pollinating the outer flowers and the wild bees like pollinating the lower flowers. This combination of pollinators can be ideal.